There are probably any number of reasons why this Manchester American Apparel store had its windows smashed during the civil unrest that has been roiling in the U.K. but none of the rioters appear to have stolen any clothes. Maybe the police showed up just in the nick of time. 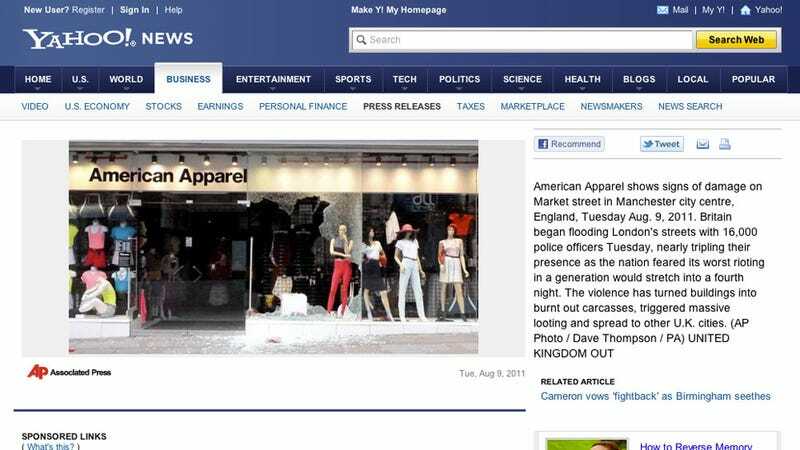 Maybe everyone had just finished looting a Diesel store, and everyone had their hands full with jeans and stuff already. Maybe a specially-trained American Apparel SWAT team burst out from their hiding places in the stockroom at the first sound of tinkling glass, wearing Unisex Flex Terry Headbands and brandishing exploding bottles of nail polish. Maybe an ice-cream truck pulled over a block away and started giving all the rioters free ice cream, creating a diversion that distracted each and every would-be looter! The obvious explanation — that American Apparel clothes are so early-90s-high-waisted-tapered-leg-pastel-preppy-U-G-L-Y that even thieves won't touch them — simply can't be it.